The births of our first two sons took place in the Northeast at two very well-respected and innovative research hospitals. Yet the family-centered birthing experience we had been longing for took place right here in Jackson, Tennessee. At times I can become cynical with the issues facing our city. We have complex challenges, and there are not always clear solutions. In spite of these issues, the birth experience of our third son and people like Dr. Chris Welsch encourage and challenge my wife and I to continue raising our family here. For as long as my wife, Laura, can recall, she has dreamed about birthing babies and becoming a mother. When Laura’s younger sister was born, her mother provided straightforward and truthful answers to Laura’s numerous questions about birth which provoked her curiosity at a young age. As Laura grew older the continued amazement with the human body and the desire to study it led her to nursing school at Middle Tennessee State University. During her OB-GYN rotation she learned more than she had ever known about the female body and how it was designed to give birth naturally. This only increased her lifelong desire to participate in the beautiful process of pregnancy, labor, and delivery. In the spring of 2010 we were living in New Jersey and expecting the arrival of our firstborn son, Jack Abraham. For the months leading up to his birth, we studied natural birthing methods, practiced how to breathe through a contraction, and I learned more about the birthing process than I had ever known. However, as the due date came and went, labor never began naturally for Laura. After numerous medical interventions and thirty-six hours of labor, we found ourselves in the operating room prepared for a C-section. Our son was delivered, we gave him a kiss before he was quickly taken away, and we spent the next few hours in the recovery room anxiously waiting to hold him. This was not the natural, holistic birthing experience that we had been preparing for. While thankful for a healthy baby, we simultaneously felt disconnected from the birth experience of our son. In the few years after the birth of Jack, Laura had the privilege of coaching family and friends in natural and unmedicated births on several different occasions. During these experiences she was able to witness firsthand the beauty of a natural birthing experience which increased her desire to experience the process even more. In the spring of 2012 we found out we were pregnant with our second son, Thaddaeus Henry. We began researching and planning with our midwives to attempt a natural birth after a previous C-section. While there was hope that we could have a natural birthing experience, ultimately we ended up with another C-section. After a few days in the neonatal intensive care unit, we left the hospital once again thankful for a healthy baby while simultaneously feeling disconnected from the actual birth of our son. While we had hoped for different experiences, we are thankful for modern medicine and acknowledge that if we lived in a time prior to C-sections our outcomes would have looked vastly different. C-sections are major surgical procedures and are guided by operation standards. While these standards, which include safety measures and precautions, serve a significant purpose, there can be a sterile disconnect from the birth of the child leaving the mother feeling disengaged. It is not our goal to demonize the C-section. If anything, we have learned that sometimes circumstances surrounding birth do not go as planned. The ultimate goal is a healthy mother and baby. However, over the last decade as the practice of birth has progressed to become more family-centered and baby-friendly, the operating room has remained entrenched in surgical rituals. In most obstetric units, babies born via C-section are quickly removed from the womb behind opaque drapes, taken to the warmer, examined, cleaned, and given shots all before being briefly introduced to the mother. They are then sent to the nursery so the mother can recover from the operation. After experiencing this type of C-section twice, Laura continued longing to be an active participant in the birth of our children. In the fall of 2013 we returned to Jackson as a family of four. Roughly two years later we became pregnant with our third son, Owen Bruce. We knew that a third C-section was inevitable, and Laura began researching a new approach. She discovered there were some hospitals starting to change how an elective, non-emergent C-section was performed. They were allowing more maternal involvement and taking steps to make the operating room feel more like an actual birth than a sterile operation. 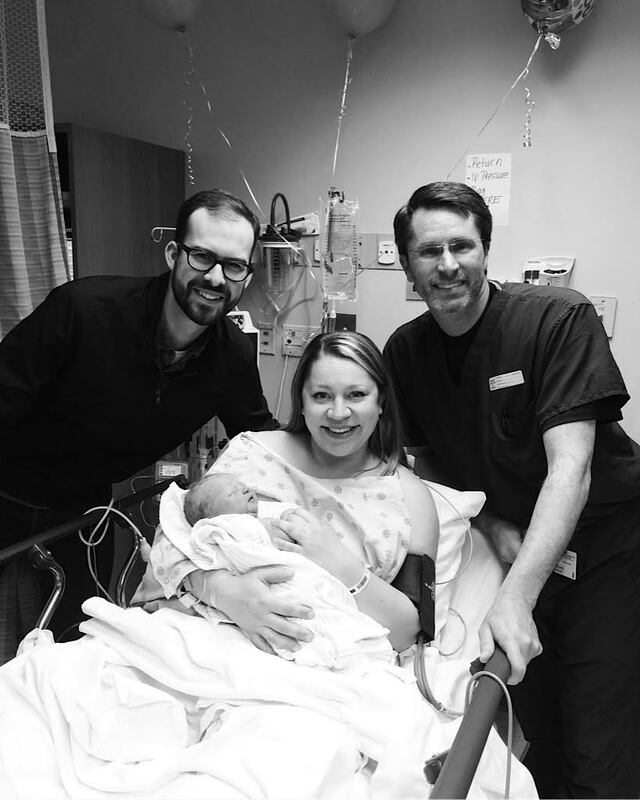 This newer approach is sometimes called a gentle cesarean, or a natural cesarean, but for our purposes here we will refer to it as the family-centered cesarean. A family-centered cesarean differs from a traditional C-section in that it focuses on patient and family-centered care, encourages early skin-to-skin contact, early bonding, and early initiation of breastfeeding. Laura would stay up late at night reading articles and watching videos of the family-centered cesareans and began to dream if we would be able to find a physician in Jackson willing to try this new approach. She knew it could be a challenge to get the nurses and hospital staff on board to try something innovative going against the status quo. Around this time we were encouraged to seek the expertise of Dr. Chris Welsch with the Jackson Clinic. We took this advice and began meeting with him to form a plan. Laura sent him journal articles, videos, and other research on this new approach to C-sections. We were pleasantly surprised by Dr. Welsch’s willingness to listen to our requests and collaborate with us. We would later realize that our experience would not have been the same without him. On the morning of March 17 we arrived at the hospital for our third C-section. This time around was different because there was a peace about the process. Our requests had been heard, we were treated with respect and dignity, and we became active participants in the birth of our child for the first time. We watched through a clear drape as our son emerged slowly from the womb. While still messy and covered in vernix, he was passed directly to Laura from our nurse. Laura was able to have direct skin to skin contact and initiate breastfeeding in the operating room. Our son never left our side. The nurses and operating room staff at Jackson Madison County General Hospital went above and beyond to partner with our doctor in accommodating our simple requests. You may have friends or family whose next child will enter this world via a scheduled C-section. Encourage them to research family-centered cesareans and seek out the expertise of the fine physicians and healthcare providers that are offering this option. It made all the difference for our family, and we hope it will for others as well. I recognize that the birth stories of our children and information on a new type of C-section will be interesting to a very small percentage of you reading this story. But as I have reflected over the last few months about Owen’s birth in Jackson and the confusion of moving back to one’s hometown after living elsewhere, I have realized that Dr. Welsch has something to teach us all. In our efforts to make our city a better place to live, work, and play we all would be wise to learn from him. He took an interest in someone else’s request, he was eager to learn alongside us, he was willing to think creatively and outside the box to challenge the status quo, and he used his talents, resources, and position to make life better for someone else. It is my hope that as we celebrate all the good in our city and continue to build upon it that we will not lose sight of our duty to address the many challenges we face. This must be held in balance if we desire to see Jackson become the best she can be. May we all proactively work together to leave her better than when we found her. Dr. Christopher Welsch has served as an OB-GYN at The Jackson Clinic for seventeen years. To learn more about the clinic and Dr. Welsch, visit the clinic's website. Ross Priddy was born and raised in Jackson and is a banker at First Tennessee. His wife Laura is from Franklin, Tennessee, and is a Registered Nurse who is currently at home figuring life out with their three boys, Jack, Thad, and Owen. Ross and Laura originally met in Colorado at a Young Life camp and then again during college at Middle Tennessee State University. After getting married, they moved to New Jersey for five years and returned to Jackson as a family in the fall of 2013.